The Prama Institute has expanded its programs in Yoga Detox and is now building a new Health and Wellness Center that will sponsor residential programs for longer term detoxification and other health issues. This program with a staff of three holistic health specialists and an MD consultant will be under the direction of Ramesh Bjonnes, who has completed training with Dada Dharmavedananda at the Ananda Marga Health Center in Cebu Philippines. The Yoga Detox program offers a holistic form of physical detox with graduated fasting with juice and vegetable broth, steam and mud baths, colonics, creative movement as well as mental detox through chanting (bhajans and kiirtan), meditation (sitting, walking, eating). The first 12 day detox conducted at the PI by Ramesh Bjonnes and Dada Dharmavedananda with a diabetic resulted in him becoming insulin free on a low calorie vegetable diet and juice fasting for five days. He remains insulin free one month since initiating treatment. Two recent Yoga of Silence workshops have produced wonderful life style changes in their participants, including 20 people having received personal instruction in meditation followed up with meditation classes to for those living locally. 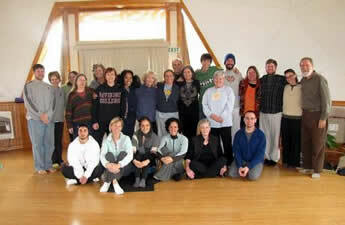 We also sponsored Ananda Marga Yoga Teacher training in July-August and are now planning for next summer’s training. Those interested in this sixth year of yoga teacher training at the Prama Institute, located in the mountains of western North Carolina, are encouraged to apply early. The Prama Institute, under the direction of Ac. Vishvamitra, conducted two successful Yoga Life Style Internships with four interns in June and three in July. This internship includes morning and evening meditation and posture yoga, yoga philosophy and practice seminars twice a week, five hours of karma yoga daily, field trips and group/individual supervision and independent studies. Some receive college credits for courses arranged between the faculty of their colleges and the PI staff who have experience and credentials to support these studies. We continue to receive many referrals for this internship and plan to begin another internship for the second year in May of 2012. The Prama Institute is having a successful fifth year with continuing growth of its own programs and rentals to like-minded groups in the field of yoga, health and the arts. We continue to have many repeat rentals, including Inner Peace’s five hundred hour certification program in yoga therapy conducted in November/December and January/February each year. This yoga therapy program features internationally known specialist in Ayurvedic yoga therapy, Mark Halpern, director of the College of Ayurveda in California and Amy Weintraub’s well known yoga therapy program for those suffering from depression. Numerous other yoga studios and alternative health groups repeat each year with rave reviews about the Prama Institute, including the friendly staff and gourmet vegetarian food and its great ambience for spiritual retreats. The networking with other yoga and health groups has resulted in many shared initiatives and greater interests in the yoga life style mission of the Prama Institute’s Center of Neohumanist Studies (CNS). We are looking forward to a year of growth with the opening of our new Health and Wellness Center on a five acre plot that provides the opportunity for expanded health programs and staff to begin our residential nutrition and detox program. The south facing meadow that the center sits on also provides a fertile area for large scale organic gardening to provide the needed vegetables and fruits for the center and the opportunity for “students”, program recipients, to experience producing some of their own food.